I've been a parent for just a little less than 3 years. In fact, Maddie will be 3 in 2 weeks. Aside from the fact that life moves much faster when you have kids, I don't claim to be an expert on parenting. I have, however, learned a few things from our girls, and I pass them along to you. Feel free to share your thoughts in the comments section below! 1. Never let anyone tell your kids that they can't laugh. Laughing is contagious. Laughing is always allowed, as long as you're not laughing at someone. 2. Let them dance. It's okay if they make noise - that's what little kids do. Life is too short not to break out in dance once in a while. 3. Little girls smile when you tell them they are beautiful. 4. Tutu's are magical. 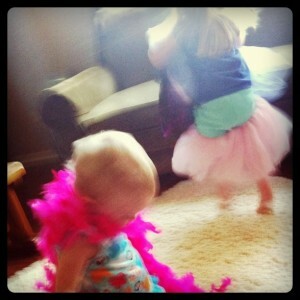 I don't know why, but anything can happen when you put on a tutu. (usually associated with #2). 5. Daughters want to do everything their mom does. Little sisters want to do everything their big sis does. 6. You're never too busy to put together a puzzle, or play with play-dough... never. 7. Someday, it won't be cool for them to give you a kiss. Take them for all they are worth while they last. 8. Being a parent is the greatest privilege anyone can have. There's nothing more important than this.